ISEA’s boat building programs connect with our mission of inspiring Great Lakes curiosity, stewardship, and passion by building a life-long love of the Great Lakes. We take care of the things we are passionate about, and we can’t think of a better way to build a passion for our Great Lakes than by helping individuals to enjoy them in/on a boat that they build. ISEA’s boat building programs are designed to provide a balance of both traditional and modern boat construction techniques. These skills are taught through a wide variety of programs. Volunteer, Mike Cherry, will lead a pram building class in the ISEA boat shop for students 10, 11, and 12 years old. Ten students will work alongside adult volunteers to build an Opti pram for 10 Saturdays beginning March 3, 2018. Upon completion of the course, students who attend the mandatory orientation and attend a minimum number of workdays will receive a scholarship to learn to sail the pram with Traverse Area Community Sailing. This class will meet from 10am-noon at the ISEA Boat Shop in Suttons Bay. The session is free, but space is limited and registration is required. This session is currently full. Click here to join the waitlist. 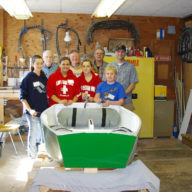 Inland Seas Education Association will be working with a group of Traverse City East Middle School students to make a group skin-on-frame canoe and individual cigar box guitars. Students will learn woodworking, shop safety, and boat building skills. This is a follow-up class from fall in which the students made a 4-person stand-up paddleboard (SUP). The class will take place in the East Middle School woodshop on Tuesdays from 2:45-5:00 pm. This after-school program is for middle-school aged students. The cost is free, but space is limited (only 15 spots available) and registration is required. Call 231-620-1148 for more information or to sign up.